This Sunday, April 22nd is Earth Day. Join me and Trevor Childress from Outdoor Chattanooga at 2:00pm for a walk at Greenway Farms to identify edible and medicinal plants growing around Chattanooga. We will be meeting in the parking lot near the quarry. Wear sturdy shoes, and bring paper and pencil. This walk is free, and no registration is required. Butterflyweed’s other common name, pleurisy-root, indicates its medicinal value for the respiratory system. Vibrant-orange clusters of blooms dotting Southeastern roadsides beginning in early June and lasting into late summer attract more than just the human eye. Butterflyweed (Asclepias tuberosa), a native host-plant to Monarch, Gray Hairstreak and Queen butterflies, is a fabulous garden addition for both beauty and use. Considered the most medicinal of the milkweeds, butterflyweed stems also can be used for cord, as with other milkweeds. Cherokee used the cord stems for belts. Butterflyweed, however, is not edible as are other milkweeds. Butterflyweed’s other common name, pleurisy-root, indicates its medicinal value for the respiratory system. Pleurisy is a painful inflammation of the pleural lining of the lungs. Butterflyweed has long been held in high regard as a traditional lung remedy among Native Americans, and as an official drug among pharmacists and physicians. One of the best-selling, populist-inspired books in America during the 19th century was the “New Domestic Physician or Home Book of Health” by the Scottish physician Dr. John Gunn. Gunn says butterflyweed “is a very popular remedy for pleurisy in many places.” Dr. Benjamin Smith Barton, author of “Collections for an Essay towards a Materia Medica of the United States” that also was published in the 19th century, viewed butterflyweed as one of the most important of our indigenous species. Acting as an expectorant and diaphoretic, butterflyweed induces sweating without being overly heating to the system, as are most sweat-inducing sudorifics. Therapeutically, butterflyweed downwardly disperses inflammatory heat occurring in the lungs, or sometimes in the head. To me, the blooms symbolically indicate that they disperse upward heat, as the center, upwardly reaching petals range from dark orange to red, and the opened petals pointing downward are lighter orange. Of the Native American tribes that utilized butterflyweed, the Omaha tribe placed the prized plant, used for wounds and lung problems, in a sacred, ceremonial context. Within the Omaha tribe, a selected member of the Shell society was the sole keeper of the remedy. After four days of ceremonial digging, preparation and consecration of butterflyweed, the authorized keeper would distribute bundles of the herb to other members of the society, according to the early 20th century pharmacognosist H.W. Youngken, of the Massachusetts College of Pharmacy. The medicinal root, which resembles a small sweet potato, is dug when the plant goes dormant. Old-timey herbalist Tommie Bass suggests slicing large roots to dry and store. For a tea infusion for the lungs, steep or simmer a handful of dried roots in water, and take a tablespoon as often as needed. For wounds, powder the root, and apply to the sore topically. Some Native American tribes would blow the powdered root onto the wound, which was thought to activate the medicine. Butterflyweed’s flowers contain cardiac glycosides, the constituent found in foxglove (Digitalis purpurea) that for centuries was used to treat congestive heart failure. Monarch butterflies ingest this toxic compound, which does not harm them, but serves as protection against various bird predators. 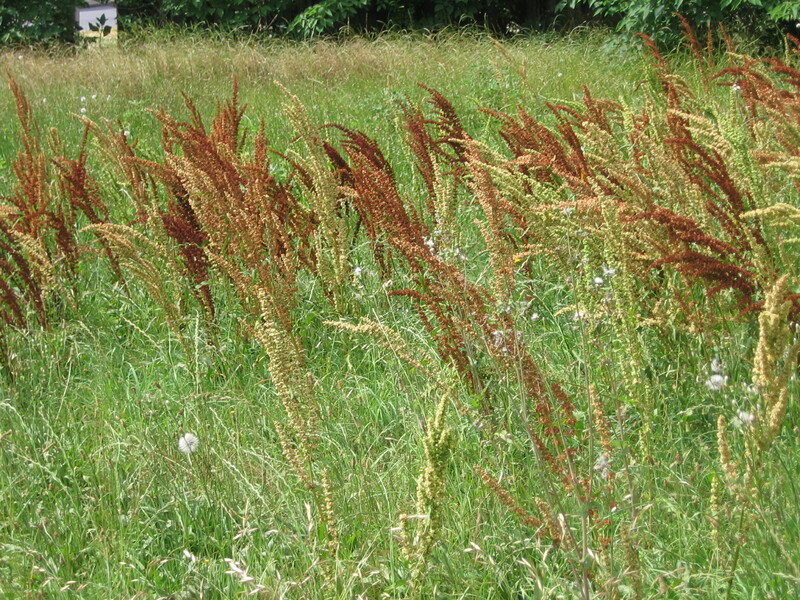 Birds poisoned by monarchs with high cardiac glycosides vomit for up to half an hour. Some birds will sample the tip of a Monarch wing for the distinctive taste of the cardiac glycosides before preying on the butterflies. Studies have found female butterflies have a higher content of the glycosides than males. 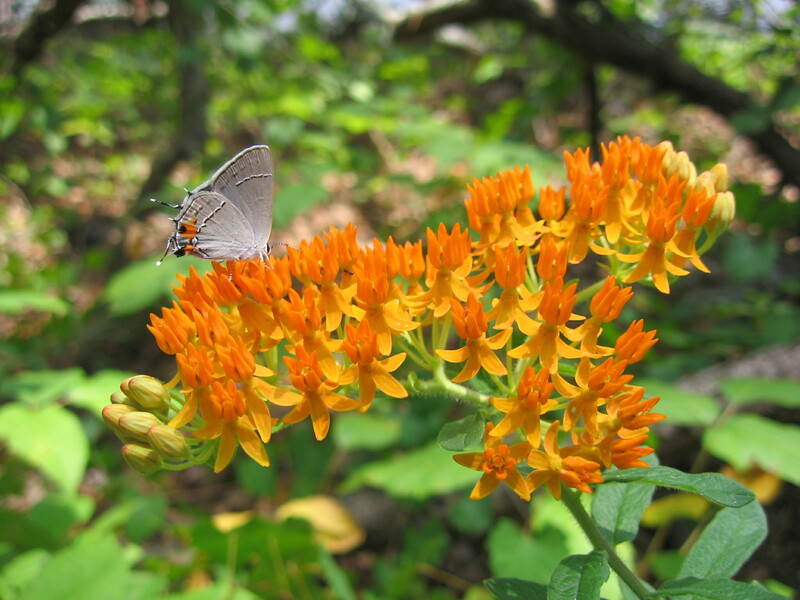 Current research on butterflyweed offers exciting prospects in sustainability. In May, the “Journal of Agricultural and Food Chemistry” published a study utilizing the seeds of butterflyweed as a renewable source for industrial lubricants, an alternative to nonrenewable petroleum-based sources. This article was originally published in Athens Banner-Herald on Sunday, June 12th, 2011. Yarrow’s reputation as a first-aid hemostat has spread throughout the world with the herb, and its common names — soldier’s woundwort, knight’s milfoil, carpenter’s weed — reflect those who were most appreciative of its powers. A medicinal powerhouse of the cultivated garden and wild spaces alike, Yarrow carries within its botanical name a recommendation from antiquity. Yarrow (Achillea millefolium) is named after the Greek hero Achilles who healed the bleeding wounds of his soldiers with its foliage. Millefolium means thousand-leaves, referring to its ferny foliage. According to the Lady Bird Johnson Native Plant Database, yarrow is native to the U.S., but there also are introduced Achillea species. It appears to be a gift to the globe. Yarrow’s reputation as a first-aid hemostat has spread throughout the world with the herb, and its common names – soldier’s woundwort, knight’s milfoil, carpenter’s weed – reflect those who were most appreciative of its powers. I can attest to yarrow’s fast-acting blood-staunching properties. Once, when I sliced my palm open on a yucca leaf – it’s called Spanish bayonet for a reason – I quickly found yarrow growing nearby, as it often does, and applied a poultice of leaves to my wound. Within five minutes or less, the pain and bleeding were gone, and within 24 hours the cut was completely healed. A couple days more and all evidence of my suffering had disappeared. Some of the hemostatic, blood-staunching properties come from the bitter sesquiterpene lactones specific to yarrow, achillian and achillicin. Like chamomile, yarrow also contains asulenes, which contribute to its anti-inflammatory actions. 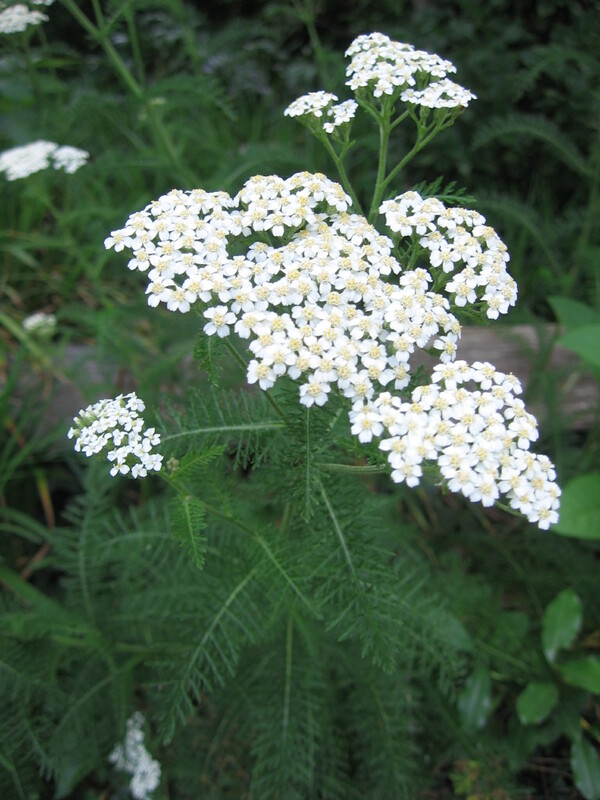 Several essential oils lend yarrow its antiseptic qualities: pinine, borneal, camphor, eugenol, saponine and terpineol. With loads of polyphenol flavonoids, yarrow is great as a tonic for depression and memory maintenance. Mills frequently used yarrow in his formulas as a “top up,” a British term for adding a bit more to someone’s drink. He became convinced that yarrow, with its synergistic compounds that we are only beginning to understand, was often the key ingredient of his formulas. When he neglected to “top up” the formula with yarrow, filling the formula with herbs more specifically indicated for the condition, returning clients reported the formula was less effective. Yarrow is particularly suited for healing the predominant ailments of cold, damp climates, bestowing upon it a type of panacea status in Ireland and the British Isles due to its efficacy for reducing rheumatic pains, soothing flatulent bowel complaints, healing colds and fevers, and countering depression. Usually, in contemporary herb texts, yarrow is known as a diaphoretic, an herbal action that causes one with a fever to sweat, thereby bringing down a fever instead of suppressing it. With yarrow’s complex chemistry, its uses are far more extensive than merely fever management. Native American tribes all over North America widely used yarrow, perhaps more than any other plant, for ailments ranging from digestive cramps, wounds and colds to neuralgia, venereal disease, as a blood purifier, to revive an unconscious person who had fallen, and as a remedy for multiple infant sicknesses – just to name a few. Likely, if Achilles could have had only one herb to use on the battlefield, it would have been yarrow. But his legendary application begs the question: Did Achilles apply it to the mortal blow to his heel, or was it just out of reach? Originally published in the Athens Banner-Herald on Sunday, May 29, 2011. The entire plant of evening primrose (Oenothera biennis) is edible, and a good source of GLA, an essential fatty acid. As the sun lowers toward the horizon, the yellow evening primrose prepares to bloom. For those who like to be enchanted by nature, gather a few friends at twilight, and wait for the blooms to open right before your eyes. Evening primrose (Oenothera biennis) is native to North America, and is no relation to the English cowslip primrose (Primula veris). When evening primrose makes an appearance in the spring, it is a low-growing, basal rosette mass of leaves speckled with red. Throughout the summer, a very leafy reddish stem grows up from the center of the basal rosette, eventually reaching 3 to 5 feet. The four-petaled, yellow flowers are unusual in that they flower at the end of a long pipe attached to a tube-shaped ovary, which will become the seed-containing fruit. Within the seeds of the evening primrose, a valuable oil is held. I eat the whole fruits to get the oil. The entire plant is medicinal and edible. Currently, however, the seeds are the most used part of the plant. The oil found in evening primrose seeds is high in gamma-linoleic acid (GLA), an essential fatty acid (EFA) converted from linoleic acid by an enzyme called delta-6 desaturase. Some people inherit an abnormality in EFA metabolism because they lack the delta-6-desaturase enzyme needed to convert linoleic acid to GLA. This creates problems since GLA prevents proinflammatory eicosanoids, such as prostaglandins and leukotrienes, from becoming excessive and causing chronic illness conditions associated with inflammation, such as atopic eczema, asthma, rheumatoid arthritis, diabetes, heart disease, PMS and breast pain. Since the 1980s, many clinical trials have shown efficacy in using evening primrose oil to treat atopic eczema, an escalating condition among children. Trials reported that after administering evening primrose oil for four to eight weeks, the roughness, redness and itchiness of the skin was reduced. After discontinuing the evening primrose oil, the improvements remained, and the condition did not revert back to the pre-evening primrose state. Studies indicate evening primrose is less effective in people who have received frequent corticosteroid treatment. Another interesting use of evening primrose oil is in the treatment of the neurological effects of alcoholism. Long-term alcohol use decreases linoleic acid in the blood, and creates a deficiency in EFAs, which isn’t good since EFAs provide the structure for nerve conduction. Alcohol use also blocks linoleic acid from converting to metabolites used in brain structure. Further, alcohol increases the manufacturing of proinflammatory prostaglandins. Administering GLA and other EFAs has seemed to minimize the negative effects of alcohol. Medicinally, Cherokee Indians have used an infusion, or tea, of evening primrose leaves to stimulate weight-loss. 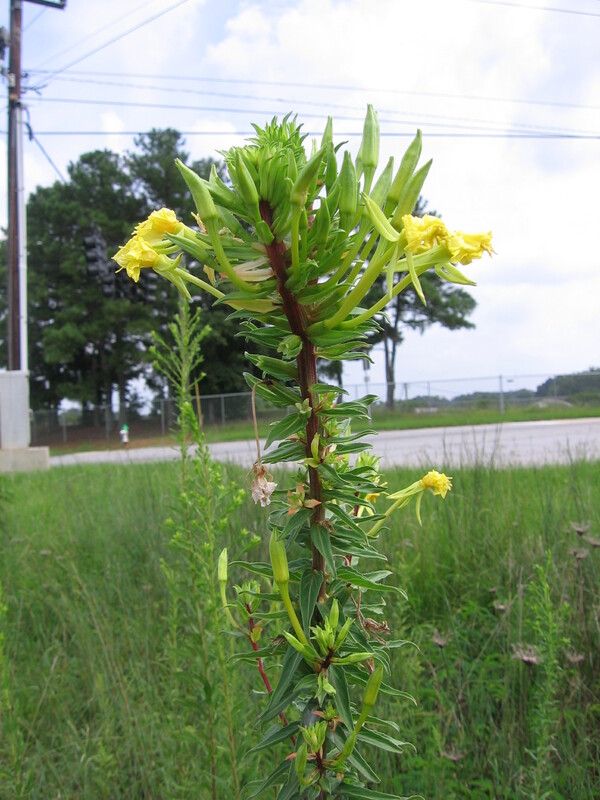 The Ojibwa soaked the entire evening primrose plant in warm water and applied it as a poultice to burns. 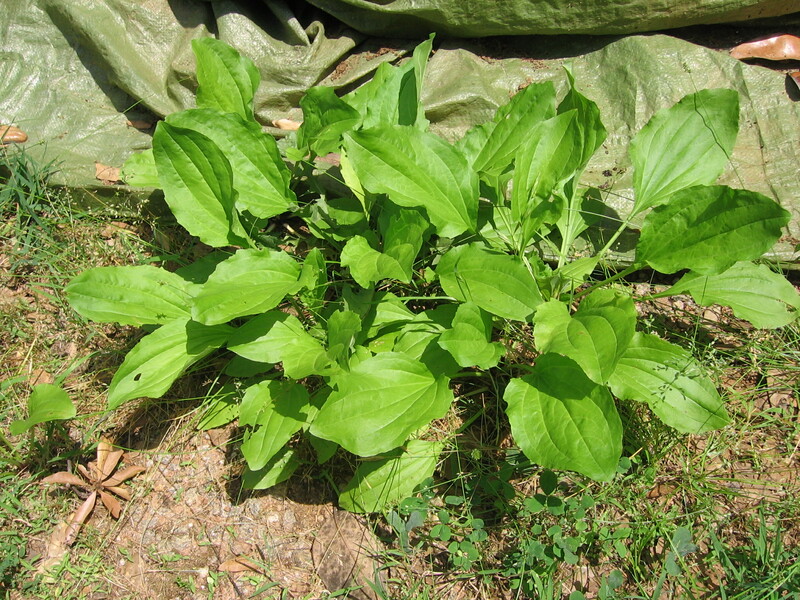 As food, Cherokees also cooked the spring leaves as vegetable greens, and boiled the fall roots like potatoes. The Gosuite of Utah ate the tiny, oil-rich seeds, which is the most direct, and cheapest way of getting your GLA. The above article originally appeared in the Urban Forager column of the Athens Banner-Herald on Sunday, September 5th, 2010. Plantain grows in any kind of soil, from gravel and sidewalk cracks, to rich garden soil. 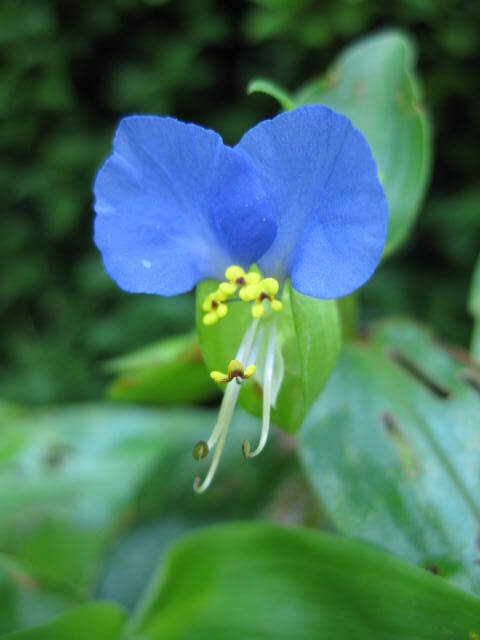 This native British plant has bright-green, round leaves growing in a basal rosette. It bears a green-brown, cylindrical flowering spike with teeny lilac and yellow stamens. Depending on the soil, plantain’s size will range from 5 inches to a foot in height. The herb plantain is no relation to the tropical fruit plantain, of which the banana is a subspecies. Plantain grows in any kind of soil, from gravel and sidewalk cracks, to rich garden soil. 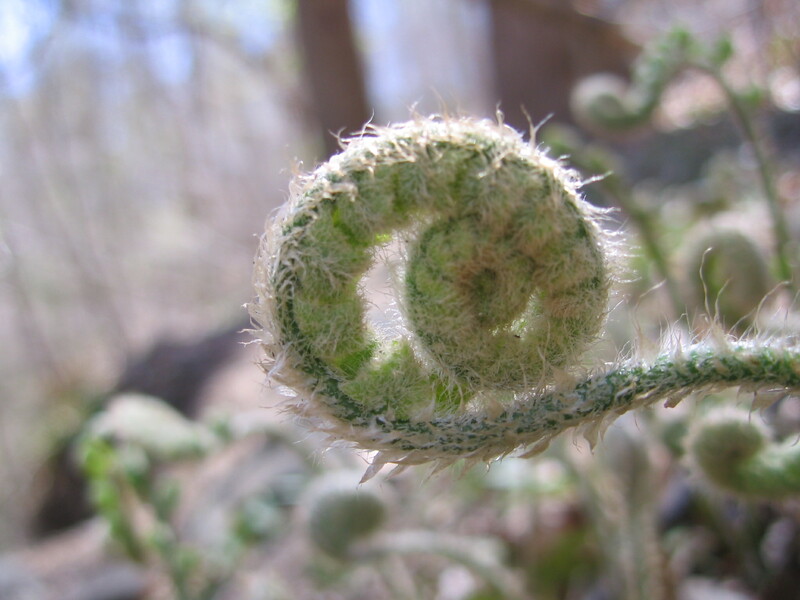 This British native has bright-green, round leaves growing in a basal rosette. It bears a green-brown, cylindrical flowering spike with teeny lilac and yellow stamens. Depending on the soil, plantain’s size will range from five inches to a foot in height. The herb plantain is no relation to the tropical fruit plantain, of which the banana is a subspecies. Plantain grows everywhere Europeans have settled, and is despised in many countries for its link to a colonial past. Worse plants could follow a population around. The edible and medicinal properties of plantain make it a top plant for the survival of a settling community. Its early spring leaves are edible either raw in salads or boiled as a pot herb, and high in many vitamins and minerals. Long ago, plantain was highly respected in its homeland. It was considered one of the nine sacred herbs of the ancient Saxon’s, and called the “mother of herbs” in Anglo-Saxon poetry. Once established in North America, plantain’s value was quickly recognized by American Indians. One tribe gave it a name which translates as “life medicine,” a kind of panacea, or cure-all. Internally, Colonial Americans used plantain to reduce prolonged fevers, to prevent tuberculosis when early symptoms were presenting, and also to treat cholera. Plantain “purifies” the blood and tones the lungs when there has been a debilitating illness. Recent clinical studies show plantain’s efficacy in chronic bronchitis, and for symptoms of the common cold. In combination with other herbs, plantain has shown analgesic activity when treating pain due to chronic gastroduodenitis. Topically, plantain is a marvel when applied to bites or stings. When applying plantain to an insect bite, simply pick a leaf, chew it for 10 seconds until the mucilage is released (rubbing it in the fingers a bit is also an acceptable method if one would rather not chew the leaf), and place the wad of juicy plantain leaf directly on the sting site. Leave it in place for five minutes. The itch and inflammation will completely disappear. As a salve, plantain soothes irritated or ulcerated skin and wounds. With great irony we tread over a seemingly insignificant plant, unaware of its value, though named after the path of the colonizers who trod over lands often unaware of the value of the land’s diversity, and the culture of its inhabitants. The above article appeared in the Urban Forager of the Athens Banner-Herald on Sunday, August 29, 2010.